Gnomes are often disregarded as weak, due to their size or culture. But nothing is farther from the truth. Their most deadly weapon is their cunning. It is with intelligence that they can turn the tide of a battle. 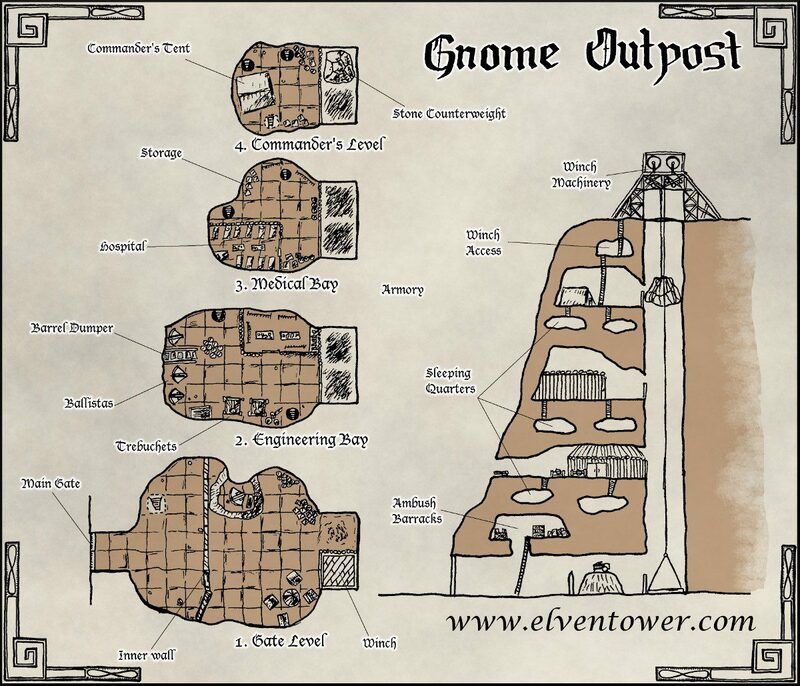 To protect their most important settlements in lands that are roamed by savage races like orcs, gnolls or goblins, gnomes build militarized outposts. The troops in these protective settlements is to stop invading parties of unwelcome creatures. You can use this outpost in two different ways. The PCs can attack it, along with a platoon of soldiers or the like. Or the PCs can help defend the outpost against an assaulting party. I find the second option the most fun. You can arrange an attack that comes in waves, and little by little the PCs and then gnomes double back to the highest parts of the outpost. Similar to the defense of Helm’s Deep, in LOTR, but in a smaller scale. The offenders could be orcs, gnolls, goblins, even humans. Gnomes are smart and have built series of defense measures. In the Gate Level, there’s a hidden barracks in the ceiling. From there, troops can shoot directly at enemies trying to cross the inner wall. They can dump explosive barrels or even jump down the ladders and attack ! In the engineering bay, gnome experts shoot at incoming troops with ballistas or trebuchets. If enemy troops reach the main gate, they can rain explosive barrels down on them. All the levels are communicated by the main winch. It is 10ft by 10ft and can lift a full armored platoon, and even the siege weapons. Next to the winch shaft is an empty shaft for the stone counterweight. The ropes sustaining the platform and the counterweight are reinforced with alchemical solutions. They are highly durable and very tough to cut. If one of the ropes is ever cut, the counterweight and platform fall down and crush anyone who is under them. If the main winch, or the machinery are destroyed, all of the outpost levels are isolated. Climbing skills would be required to go up or down the outpost. First I want to thank U for your amazing maps. I use them mostly for my OOtA campaign. I used this one last session for en encounter outside the Pikeshine Mines near Blingdenstone. It was a night attack by the pursuing drow, with a drider and a lot of spiders (giants or swarm) in the elevator. It ended with a fight against the drider in the winch machinery, spiderman style. My players and I had a blast and I wanted to let U know.